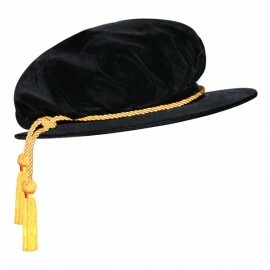 The Doctorate Beefeater is an essential component of a doctorate degree graduate's graduation regalia. Gradshop's extensive lineup of elegantly crafted doctorate beefeaters is sure to provide your precise needs, often exceeding your highest expectations. Our Doctorate Beefeaters are made of fine quality velvet fabric and fits securely on the graduate's head via the high quality leather head band. There are the 4-sided and the 8-sided beefeaters which both come with gold bullion attached to it. Gradshop also provides customization services for these amazing doctorate beefeaters to ensure they meet each and every specification you require. These really are the perfect symmetry of style, comfort and quality at the lowest prices. Get yours now, only here at Gradshop.com.